We are honored to announce that The Pledge has been chosen for the 2019 season of the Madison New Works Lab at James Madison University in Harrisonburg, Virginia. 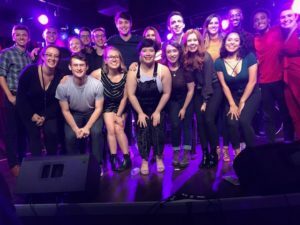 The mission of the Madison New Works Laboratory is to create a nationally recognized incubator for the development of new plays and musicals. We want to thank the selection committee for choosing our musical, and we appreciate the support of Rubén Graciani, Director of JMU’s School of Theatre and Dance. We look forward to working with our director, Kate Arecchi, Associate Director of the School of Theatre and Dance at JMU and Musical Theatre Coordinator, as we begin the casting and rehearsal process. Performances of the staged reading of The Pledge will be on May 30 and 31, 2019 and they will be open to the public. Here’s our wonderful company who brought The Pledge to life. From left to right: Katherine R. Wilkins (director), Michael Shofi (Logan), Nolan Murphy (Guy), Anthony Castellano (Bucky), Levin Valayil (Adam), Jacob Sutherland (Jamie), Emily Iocovozzi (Em), Colin Campbell (Frank), and Susan Madon (Karen). 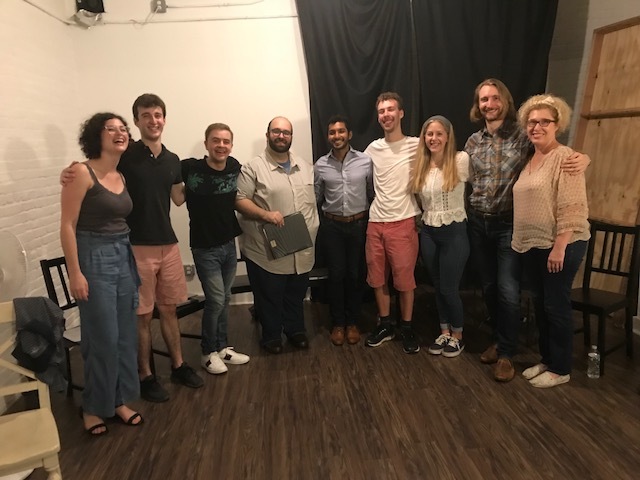 The Pledge was selected in competition for a first-ever staged reading by the Sitting Shotgun theater company for their Fall Reading series (September 15 – 16, 2018) in Brooklyn, New York. It was thrilling to hear the musical performed in full. This gave us the opportunity to make changes to the script based on feedback from the director and actors. We are receiving interest in The Pledge from a number of venues. Our goal is to develop the musical to the next level so it can reach its full potential as we prepare it for future productions. We’re thrilled to announce that The Pledge has been chosen to be part of the Shotgun Reading series for the Fall 2018 season of the exciting Brooklyn theater company, Sitting Shotgun. See the Broadway World article that mentions The Pledge by clicking here! Jacob Sutherland, who recently starred in the New England premiere of Bubble Boy in Portland, Maine, will play the lead and Katherine R. Wilkins will direct. The reading will take place on Saturday, September 15 at 7:00 p.m. and Sunday, September 16 at 2:00 p.m. at SQUARE1 (Park Avenue, Brooklyn, NY), Sitting Shotgun’s new home space. Admission is free and the performances will be followed by a short talkback with members of the creative team. 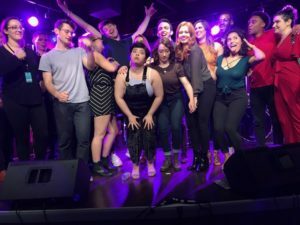 We were thrilled to have our song “Check the Boxes” receive its professional debut at the New York Musical Festival’s “Breaking Ground” concert in NYC with performances on July 27 and 28. Thanks to a wonderfully talented group of performers and a great band that truly made the song their own! 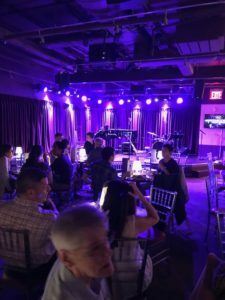 Here are some photos from the concert (and our time in NYC)! The Green Room 42 a half hour before showtime. The cast posing for a post-concert photo. The cast giving paparazzi in the audience one last (playful) pose. 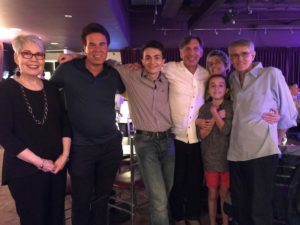 Our wonderful group of close friends on opening night (from left to right): Maxine Borowitz, Michael Emrich, Zev Burrows, Mark Evan Chimsky, Kimberly Gladman and her daughter Sofia, and Richard M. Morse. 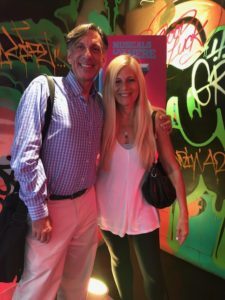 Dear friends at the matinee performance: Mark and Joanna Laufer. 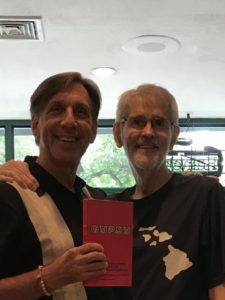 A special gift for a special occasion: before the concert, Richard M. Morse presents Mark with a copy of the Fireside Theater Book Club edition of Gypsy, one of his all-time favorite musicals, with a great book by Arthur Laurents, fabulous music by Jule Styne—the best overture ever!—and brilliant lyrics by Stephen Sondheim.